Are You Confused By All The Conflicting Nutritional Advice? You want the healthiest diet for you and your family, but it is so confusing. Food myths abound. On the internet everyone is an expert. Who should you believe? What is the truth? Will saturated fats kill you, or are they good for you? Is meat your friend, or your foe? Are grains poison, or are they good for you? Is low-carb best, or is it low fat? Should you go vegan, Mediterranean, Paleo, or Keto? Dr. Chaney understands your confusion. He understands your pain. In this book, he gives you science-backed answers to these questions and much more. An award-winning professor who taught human metabolism and nutrition to medical students at the University of North Carolina at Chapel Hill for 40 years. An internationally recognized scientist who has published over 100 research studies and reviews in peer-reviewed scientific journals. A sought-after speaker on holistic approaches to health. His mission is cut through the claims and counter-claims and slay the nutrition myths. He searches the scientific literature to provide you with scientifically accurate answers to your nutrition questions. He is dedicated to giving you the truth about food and diets. In this book, Dr. Chaney points out the pros and cons of each diet he analyzes. Instead of recommending one perfect diet, he provides you with a variety of healthy diets, and guidance so you can choose the one that is best for you. Most diet book authors are not trained scientists. They assume all clinical studies are equally valid and select the ones that support their viewpoint. Dr. Chaney understands the strengths and weaknesses of clinical studies. He selects only the very best clinical studies and uses them to guide the recommendations he makes. Dr. Chaney debunks the myths and misleading information that are so prevalent in the nutrition sphere today. He also points out the weaknesses in some of the studies that back truly healthy foods and diets. Dr. Chaney does make specific recommendations about foods and diets when he thinks they are based on good science. 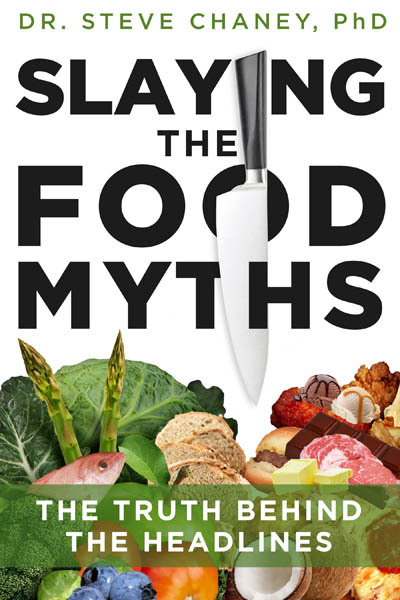 But the real purpose of this book is to give you, the reader, the knowledge you need to recognize and slay the food myths. It will arm you to avoid pitfalls and wayward paths along your quest for better health. It will empower you to make healthy choices today and in the future.